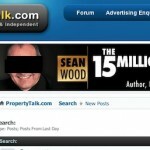 It strikes me as ironic that the banner ads on PropertyTalk (the site I celebrated and linked to yesterday) now appear to feature ex-Richmastery property spruikers Sean Wood and Steve Goodey in their latest incarnation. Er, yuck. Surprise! Sean Wood — still advertising on a site he said the world would be a better place without. These two wide boys, graduates of (spat out of?) the Phil Jones charm school, have apparently divorced their latest former loyal confederates (who’ve fallen on hard times, tsk) and partnered up (cue song: Endless Love) to bring their brand of self-aggrandised spruiking to a wider public. How long will this marriage last, I wonder? Nice testimonial. But now Steve’s left Dean, apparently, and moved on to play in another pool — with Sean Wood. Sean Wood’s track record is just as inspiring (not quite the word I was looking for). Speaking personally, these two spruikers strike me as the types who would say anything and claim anything about themselves to sell themselves — no matter how hyperbolic or suspect the claim. 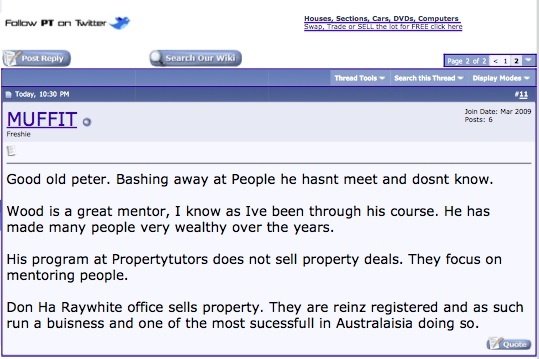 Steve Goodey describes HIMSELF as “…a NZ property investing icon who has established a proven track record of local success for himself and the select few he teaches.” Wow! An ‘icon'(pfft!) The ‘established proven track record’ part is right … but as what, exactly? In a similar vein, it seems to me that Mr ‘I sold 149 Sacramento Apartments’ Sean Wood has revealed he’s willing to anonymously pose as his own satisfied customer and in that guise, to speak extremely highly of himself. 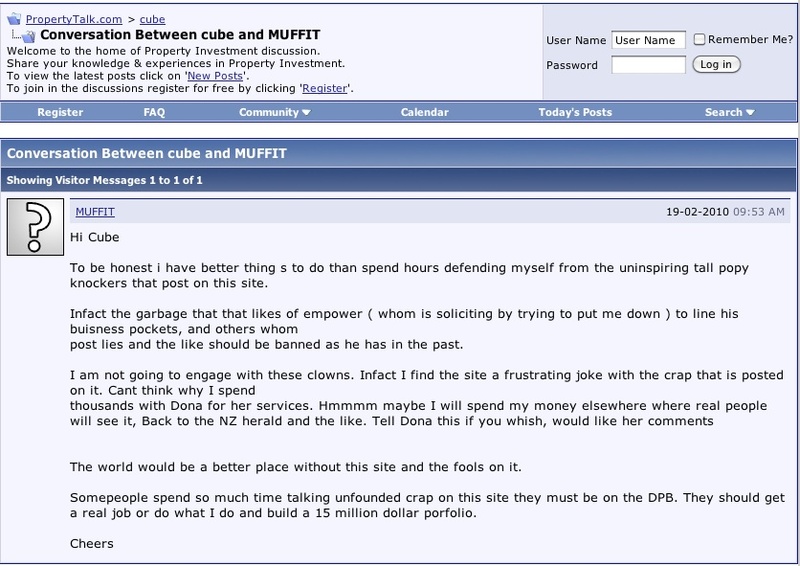 Here is sockpuppet/alter-ego MUFFIT (revealed as 15 minute man Sean Wood here) responding to a suggestion on PropertyTalk (actually by me) that perhaps Sean Wood’s business practices in 2009 with Don Ha would possibly resemble or emulate his business practices of a year or two earlier as a Richmastery ‘mentor’. Sean Wood says: “Wood is a great mentor, I know as Ive [sic] been through his course” … umm, Yes, Sean. But isn’t that because it’s run by you? 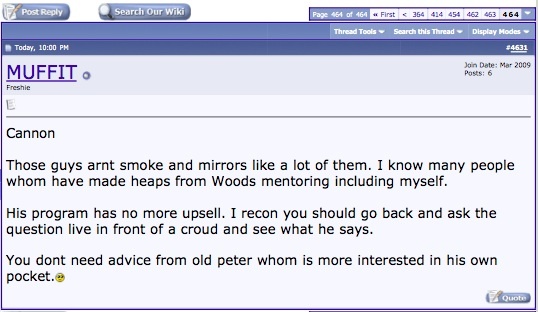 Classic line from Sean Wood: “I know many people whom [sic] have made heaps from Woods [sic] mentoring including myself.“ Hilarious! As you might imagine, I am amused and nonplussed to be linking to PropertyTalk while these rubbery salesmen (IMHO) are actually using that fine website to offer punters the chance to “Be In The DRAW For A Chance to WIN $100,000 CASH *Terms & Conditions Apply” … Oh yes, that’s real investor-bait, that is. Not. “Now he’s gone and joined that stupid club” (Kurt Cobain’s mother). Speaking of stupid clubs, I see another “guru” that PT relentlessly promoted (Chris “Action is My Drug of Choice” Ashenden) has joined the stupid spruikers exposed club. Well did he? This seems unlikely to me. Usually spruikers have no net assets to speak of – they live from scam to scam. Ha. Says it all. Maybe he wasn’t breast fed as a baby? Holy cow that is a terribly damning article reporting the judgement and conviction for breaching the Fair Trading Act! The Judge was obviously not impressed with Chris or his arguments. Calling his bankruptcy ‘a ploy’ .. jeez. It may be less fashionable these days but I’d like to publicly speak up for Chris. I didn’t count Chris as a spruiker and take no pleasure in reports of his downfall, if that’s what it is. The Herald’s summary “vulnerable kiwis were tricked into thinking they were buying properties when they were not” seems too extreme to me. How it looks to me: Like others he set up a business based on ‘wrapping’ — effectively funding people with damaged credit into a long term, non-traditional house purchase. Dealing with that end of the market is inherently unstable, with deals falling over … but not necessarily because they were set up to fail. You’ve got to remember these ‘buyers’ couldn’t get bank funding. I also do not buy the idea that buyers of houses on wraps or lease options didn’t have the deals explained to them properly (although that’s overtly stated in the NZ Herald article). My opinion: They knew they weren’t getting a ‘normal’ bank loan, but a credit transaction more akin to hire purchase. I’m not basing these comments on knowledge of Chris’s paperwork, but I’ve seen various wrap agreements (long term sale and purchase agreements) over the years and I know they evolved. GST really complicated things but some of the schemes totally relied on claiming back GST on the whole purchase price but only paying it back on the instalments … anyway too much detail. I personally found Chris to be pretty straight, although I had no business dealings with him. Fair enough. Poomastery never met the guy. To be fair, Mr Ashenden didn’t really pitch on PT. For this, he is no doubt a lesser offender than the professional spruikers who often dominate PT. Nonetheless, poormastery noticed at the time that his “investment” advice was questionable, and thought that it would all come unstuck eventually (though I feel no sense of schadenfraude at his subsequent “downfall”). PT was in no mood to have dissenting voices criticise a “super investor” in those days – particularly their number one celebrity. 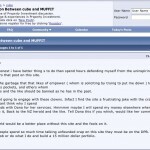 From reading his blog, he was a no money down guy. He used his credit cards to fund buying in a small town (Invercargill) with extreme leverage in 2003. He didn’t visit the places he was buying -he just bombarded agents with lowball offers until his fax machine was full of signed S&P agreements for lemon properties. Is this really good investment advice? In normal circumstances, poormastery would surmise that this strategy could lead to complete disaster. Yet 2003 was not normal times. Indeed, poormastery himself adopted a similar strategy that year – I bought a lot of properties in a small town, and subsequently made massive returns. [Not with credit card deposits, and I visited every property I bought, plus viewed many more]. Nonetheless, poormastery immediately subsequently realised that I got lucky with the massive and extraordinary capital gains that I made. A credit bubble does this. The extreme leverage approach (similary I am very short yen at the moment) usually works (or not) for a relatively small window of opportunity. Perhaps Mr Ashenden thought that his successful gamble was a sign of immense genius or talent? Reading his blog, this was the impression poormastery gained from it. Perhaps I am being unfair. It seemed like there were no risks – just “massive action” and subsequent massive rewards. Of course, poormastery sometimes prefers massive rumination to massive action. Indeed, poormastery often prefers complete inaction. For example, quietly drinking beer and eating pizza on the couch, and watching TV, sounds preferable to hours on the fax machine. I will never make a good cult member, because these guys are just property speculators, exhorting you to do something that is basically dull but could be financially rewarding (or not, depending upon the cult). Mozart was better? And a cult it was. From the silly blokey chit chat, to the insistence of regurgitating the nonsense sayings of various false idol gurus, faith healers and spiritual leaders, the entire pitch left poormastery feeling cold. No risk management. No liquidity risk evaluation. Just “massive action”. Maybe poormastery is destined to always be a cynic? Gee, poormastery, your writing ‘voice’ makes me smile! Widely. Good for you. No, I will never make a good cult member either — although next time we meet for coffee/beer/pizza, remind me to tell you of my experience in northern California. Another week and I would’ve joined (joke). Look, I agree, judges aren’t generally credulous, — Peter Cook’s joke about coal miners being retired when they get too old and stupid to do the job “.. and it’s just the opposite with judges” notwithstanding. I don’t know how Chris ran his operation, and I wasn’t in court, so my comments are, yes, based on ignorance of the evidence presented to the judge which led to the conviction, fine, reparation payments — although already bankrupted — and his castigation in those terms reported. By the look of it, you’ve paid more attention to his public statements and PT ‘persona’ than I have. I just wanted to say, hey, I knew him, and that judgement seems incongruous with that knowledge. I also knew how people were doing wraps in the early days, good people, and they were, it seemed to me, doing it ‘straight’. The courts have ruled that any person who conducts a wrap/LO is a promoter of a property scam who preys on vulnerable people. … The point is it does not matter how ethical, understanding, honest and cooperative you are (Robyn etc) you will not stand the scrutiny of the Comcom [Commerce Commission]. The Comcom and the courts view even the best successful wraps/LO as a scam. Anyone who has done a wrap/LO has the potential to have your name in an article just like the one listed above. Simply paste your name in the place of “Chris Ashenden”. Poormastery is certainly no where near leaping to these conclusions. Poormastery always thought that these LO / SLO et al “deals” should be illegal, so is pleased to see the back of them – even if you say many “good people” engaged in these structures. Irrespectively, it seems that many people have engaged in various structures without accurately assessing the legal risk? However, changing the rules retrospectively (as this “Camdrive” character on PT claims has happened) does not seem to be particularly fair either. A ban looking forwards is one thing, a new treatment towards “deals” undertaken many years ago another.